Let’s take a look at the features of each version. I think that the main feature is that now SQL Server can be installed in Linux and Docker, which is huge. There is no universal installer. In fact, the installers for Red Hat, Ubuntu and SUSE are different, but it is a huge step to support Linux. In this version, CLR assemblies can now be added to a white list. New dynamic Management views (DMV) like the sys.dm_db_log_stats, sys.dm_tran_version_store_space_usage and sys.dm_db_log_info. SSIS is now supported in Linux. In SSDT, you have now a DAX editor and tabular databases are the default installation. In SSRS, you can run native DAX queries. R Services changed the name to Machine Learning Services and access to Python libraries. In SQL Server 2016, PolyBase support was introduced. With PolyBase, you can query NoSQL data like csv files stored in Azure Blob Storage or in HDInsight. Another interesting feature is JSON support which includes new features to handle JSON data. Stretch database is another feature that allows to archive data in Azure SQL. It is also possible to use temporal tables to save data changes. 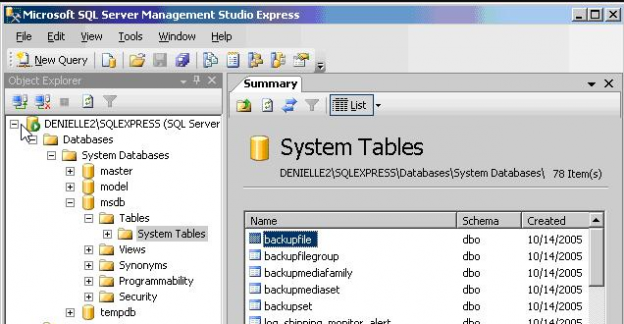 SQL Server Management Studio is separated from the database engine. It includes its own versions. Always encrypted is introduced as a new feature that allows to increase your security. Dynamic Data Masking helps you to protect sensitive data. Also, you can apply now Row Level Security. SSRS now supports a web Report Portal and a Mobile Report Publisher. SSIS now supports Always On Availability Groups. The main features in SQL Server 2014 were the integration to Azure and Memory Optimized Tables. You can for example migrate your Database on-premises to a Virtual Machine in Azure. It is possible to migrate a database backup to Azure. Your Data files can be stored in Azure. There are enhancements in AlwaysOn, Columnstore Indexes. You also have Power View reports for multidimensional models. In this new version, the BIDS (Business Intelligence Development Studio) was replaced by SSDT (SQL Server Data Tools). This SQL Server version can be installed in Windows Core Edition, a secure operative system. Business Intelligence edition for SQL Server was introduced; An edition that supports the most important features related to Business intelligence. Another big feature is the AlwasyOn SQL Server Failover Cluster Instances, AlwaysOn Availability Groups. SSMS includes IntelliSense features and a Database Recovery Advisor. FileTable support to handle system files in SQL Server. The semantic search is a feature included in Full text search to search in unstructured documents. Columnstore Indexes is another powerful feature to get faster query responses in tables like Data Warehouse tables. Online index creation is now supported. In Business Intelligence, the support of Tabular Models and the DAX functions was a very significative change. The same the support of Power Pivot. In SQL Server 2008, Adventureworks was not included in the Database installer like in SQL Server 2005. Another important difference was the backup compression. It was possible to create customized audits using Auditing. Another important feature was the CDC (Change Data Capture) to track changes in a table. Data Collector was a feature to collect monitoring information in a Data Warehouse. SQL 2008 also offered compressed indexes and tables. In data types, it was introduced the hierarchyid data type and spatial data types. Also, some new date and time data types and User-Defined data types. You can also implement in this version filtered indexes and statistics. Another big feature was the Transparent Data Encryption and some encryption functions like the CRYPT_GEN_RANDOM and KEY_NAME. This version introduced the SSMS that we use now. The BIDS (Business Intelligence Development Studio) was created in this version. SQL Server included the Adventureworks database in the installer. This version introduced the Service Broker to handle message queue. SSIS was introduced. In the past, it was used the Data Transformation Services with a different technology used which was completely changed. The Reporting Services and Analysis services used a completely new platform. This version introduced the XML enhancements, CLR support, Failover Cluster Enhancements, Database Mirroring, Database Snapshots. SQL Server 2000 was an important version where the OLAP Services in SQL 7 was replaced by the Analysis Services. It was also introduced the XML support, User Defined Functions, Indexed Views, Replication enhancements, Log Shipping and more. This version included tools for query analysis like the Query Analyzer (which was replaced by the SSMS in SQL 2005). It introduced OLAP Services (SSAS now) and Data Transformation Services (SSIS now). This code base was now fully independent from Sybase. Nice wizards to create tables, indexes, stored procedures, replication and schedule backups. It was also introduced SQL Profiler, which is still in the last versions but will be removed soon. What’s New in SQL Server 7.0? This version was ANSI Standard Compliant, and it was based on Sybase codebase. In this version, SQL Server was an important database in the market. This version was supported in Windows 95. The main feature in this version was the replication. This version started to support Windows NT. SQL Server 4.2 was supported in Windows NT and OS/2 (an IBM-Microsoft OS). This version was available in Windows 3.0 and OS/2. In this version there was no more relationships with Ashton/Tate (the creator of dBASE). In this year, Microsoft joined Sybase. They granted permission to access the code and create a new database. Sybase created the code for Microsoft. The also joined Ashton/Tate, the creators of dBASE, to help in the marketing. There are still some stored procedures with the same functionality than Sybase. It was a nice database with networking support. It used the SAF (SQL Server Administrator Facility) to create databases, set parameters and run SQL queries. It had no documentation.